What happens when there is an error in your deed? What can you do to fix it? One option may be filing a corrective deed. A corrective deed is an instrument used to correct a small error in a deed that has been recorded at an earlier date. Corrections can only be made to non-material errors, causing no actual change in the substance of the deed. Common mistakes include typographical errors in the legal description, misspelled names, accidentally omitted suffixes or middle initials, etc. Major, or material, changes to the substance of the deed have a legal effect in how property is titled, and therefore require a new deed. Adding or removing a grantee, for example, or significant changes to the legal description, may all require a new deed of conveyance. When in doubt about the gravity of an error and whether a correction deed is the appropriate vehicle to address it, consult with a lawyer. On the corrective deed, give the recording information from the previously filed document, then identify which section contains the error. Provide the correct details in the body of the deed. The corrective deed states the nature of the error and recites the date and recording information of the erroneous deed. For the corrective deed to be valid, all parties who signed the erroneous deed must sign the corrective deed in the presence of a notarial official. If the grantor is married, Arizona requires that both spouses sign the deed (A.R.S. 33-452). Finally, the form must meet all state and local standards for recorded documents. Submit the completed corrective deed to the local recording office. Most transfers of real property are subject to a transfer tax and must be accompanied by an Affidavit of Property Value. However, corrective deeds are exempt from both because the property has already been transferred (A.R.S. 11-1133, 11-1134). This article is provided for informational purposes only and is not a substitute for legal advice. 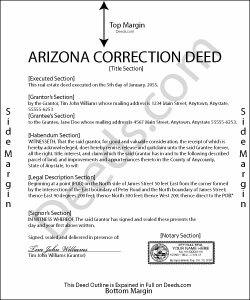 Contact an attorney with questions about corrective deeds or any other issues related to real property in Arizona. Patricia D. said: It worked great- I had a little trouble at first with the site, figuring out where to do what, but the form was much better than the one we purchased at Staples, loved being able to fill out with the computer. We did need the other form as per the screen prior to ordering but couldn't figure out which one. The ladies at the recorders were great too. Randy B. said: The form was exactly what we needed and the directions were spot on and perfectly clear. Filling out government forms can be an experience filled with anxiety but deeds.com made it easy and practically worry free. Reply from Staff: Thanks Randy, we really appreciate your feedback. Fred A. said: Very nice forms offer, very thoughtful to include other related forms that may be necessary. The site was easy to use, and very fast. Thank You. Debra D. said: Really good forms, easy to understand and use. The guide was a must have, made the process very simple. Myrna P. said: Easy to download, form very user friendly, and its customized to our county. Very much worth the money. Reply from Staff: Thank you Myrna. Have a fantastic day!